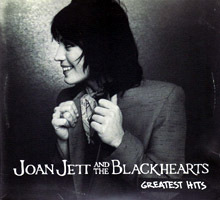 Until I bought this 2cd greatest hits collection I barely knew a Joan Jett song, apart from the obvious I Love Rock'n'Roll. Shame on me for that. Her music is actually very easy to like and very catchy. It has an easily digestable pop production to it, but most of the music sound a lot like a rockin' Suzi Quatro with a Ramones punk flavour to it. Songs like Cherry Bomb, You Drive Me Wild, Bad Reputation, Do You Wanna Touch Me (Oh Yeah) are all great reasons to like this collection of great rock music. For a Prince fan like me it is also interesting to learn that Crimson And Clover and Every Day People have been covered by both Joan Jett and Prince in different, but equally great ways.